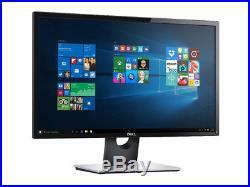 Dell SE2416H SE2416Hx 24 1920x1080 Resolution LED LCD Widescreen. Display Monitor 26W6J 026W6J CN-026W6J. Please note, this unit was our store display model and may have minor scuffs and / or scratches on plastic body, but the LCD Screen itself is in excellent cosmetic condition with no scratches! Dell Part Number: 26W6J 026W6J CN-026W6J Model Number: Dell SE2416H SE2416Hx Included: 1x Monitor 1x Stand 1x VGA Cable 1x Power Cord Smart design meets essential computing. With the expanded viewing area provided by an improved bezel, the Dell 24 Monitor offers an affordable, sleek design for every day computing. Stylish design: Enjoy the elegance of thin, glossy bezels, a sturdy base, and easy to use buttons. Video quality: Maximize your entertainment experience with rich and vibrant colors across wide viewing angles in Full HD resolution screen. Reliable and easy to use: Built to comply with the latest environmental and regulatory standards, legacy and future-ready PCs with VGA and HDMI ports. Features : Clean, sleek design Added elegance: Glossy, thin bezels, a classic black piano finish, and an aluminum painted riser create an elegant, modern design perfect for any home environment. Easy access: Easy access buttons on the bottom bezel offer a hassle-free image adjustment. Sturdy stand: Easily tilt your monitor to your preferred viewing angle with the robust stand. Vivid viewing Maximum viewing area: Get the most out of your 23.8-inch (54.6cm) viewing area with improved thin bezels. Impressive screen performance: Experience rich, accurate and consistent colors such as bright reds and deep blacks across a 178° ultrawide viewing angle in Full HD 1920 x 1080 display. Superb clarity: Minimize reflections with a sleek, remarkably clear screen. Designed for peace of mind Plug and view: Get easy compatibility with both legacy and future ready PCs via VGA and HDMI connectivity. 2 Reduced environmental footprint: The Dell 24 Monitor features PowerNap that reduces screen brightness or puts the monitor in sleep mode when it's not in use. 60.5 cm 23.8 Inches (23.8-inch wide viewable image size). In-plane switching, anti glare with hard coat 3H. 1920 x 1080 at 60Hz. Active Display Area (H x V). 20.75" x 11.67" (527.04 mm x 296.46 mm). 1000: 1 (typical), Dynamic Contrast Ratio : 8 Million :1. 178° vertical / 178° horizontal. Color Gamut (typical): 84% (CIE1976). 72% (CIE 1931)3 16.7 Million colors. 1 HDMI connector 1 VGA connector. Weight (panel only - for VESA mount). 100 to 240 VAC / 50 or 60 Hz ± 3Hz / 1.5 A (typical). 20W (Energy Star) 20W (typical) - 25W (maximum)4. Power Consumption Stand by / Sleep. We reserve the right to accept or decline your order. This agreement shall be construed under and in accordance with the laws of the state of Ohio, and all obligations of the Parties created in this Agreement are performable in Lake County, Ohio, United States of America. You may only place your order if you have read and agreed to these terms. Powered by SixBit's eCommerce Solution. The item "DELL SE2416H SE2416HX 24 LED LCD WIDESCREEN FLAT PANEL DISPLAY MONITOR 26W6J US" is in sale since Thursday, August 30, 2018. This item is in the category "Computers/Tablets & Networking\Monitors, Projectors & Accs\Monitors". The seller is "ascendtech" and is located in Cleveland, Ohio. This item can be shipped to United States, Canada, United Kingdom, Denmark, Romania, Slovakia, Bulgaria, Czech republic, Finland, Hungary, Latvia, Lithuania, Malta, Estonia, Australia, Greece, Portugal, Cyprus, Slovenia, Japan, Sweden, South Korea, Indonesia, Taiwan, Belgium, France, Hong Kong, Ireland, Netherlands, Poland, Spain, Italy, Germany, Austria, Israel, New Zealand, Philippines, Singapore, Switzerland, Norway, Saudi arabia, Ukraine, United arab emirates, Qatar, Kuwait, Bahrain, Croatia, Costa rica, Dominican republic.